Selected 3-d printed artworks and other items. 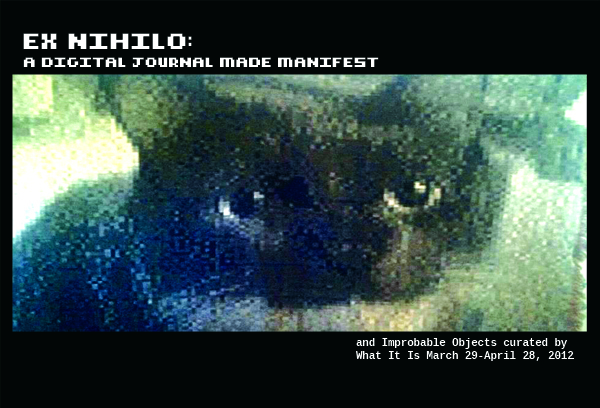 What It Is, is pleased to announce “EX NIHILO: A Digital Journal Made Manifest” a solo exhibition of works by Chicago-based new media artist Patrick Lichty. Ex Nihilo, “out of nothing” in Latin, is an outgrowth from Patrick Lichty’s obsession of the porous boundaries between the physical and the virtual. This fascination stems from Lichty working almost entirely with digital media since 1989, and after working in the online virtual world, Second Life, for nearly 30-40 hours a week for the last three years. From this prolonged immersion Lichty felt an intense need for being in-person, and translating media works into physical manifestations such laser fabrication, commissioned Chinese oil paintings, 3D printing, and now Jacquard loom tapestry fabrication. The latter of these being derived from the first programmed machine looms of the 1750’s. Although Lichty wants to express his virtual/mediated experience in the physical, it is still entirely framed within technological culture, of which he has been accustomed to since an early age. The images in this exhibition are considered as a journal or travelogue of significant moments and projects from the past ten years. These include images taken with a low resolution Casio Wristcam for his series 8 Bits or Less. Others used for the Jacquard tapestries were selected from various projects including My Day/Your Night, One, and Wikipedia Art and chosen as experiments in the translation from the virtual to the physical. Patrick Lichty (b.1962) is a technologically-based conceptual artist, writer, independent curator, animator for the activist group, The Yes Men, and Executive Editor of Intelligent Agent Magazine. He began showing technological media art in 1989, and deals with works and writing that explore the social relations between people and media. Venues in which Lichty has been involved with solo and collaborative works include the Whitney & Turin Biennials, Maribor Triennial, Performa Performance Biennial, Ars Electronica, and the International Symposium on the Electronic Arts (ISEA).